Three days dedicated to beer and not only, lots of news and special guests will be part of the biggest summer festival dedicated to the beer. Where? In Borgorose, specifically hosted in its municipal Villa, from Friday, June 17 to Sunday, June 19. We are talking about the Birra del Borgo Day, the event Birra del Borgo has been organizing for eleven years now for its birthday, gathering friends, producers, partners, musicians, chefs, beer lovers and simple curious people. 130 drafts from all over the world, with more than 30 Italian and foreign breweries selected among the leaders in the brewing field, will reflect the first aim of the festival: to stress with conviction the quality and centrality of the beer. Beer lovers will have the chance to join different meetings regarding the brewing world discovering ideas and news of the brewing field, unusual matches, as well as workshops and tasting sessions, not to mention the inevitable “cotta pubblica”. To best organize the food area, Birra del Borgo has decided to rely on a great expression of the street food, Gabriele Bonci, who will prepare tempting selections of stuffed pizza, sandwiches and burgers. Besides, there will also be a special place for Stefano Callegari’s Trapizzino, dressed up for the event with its classic and original “flavors”. 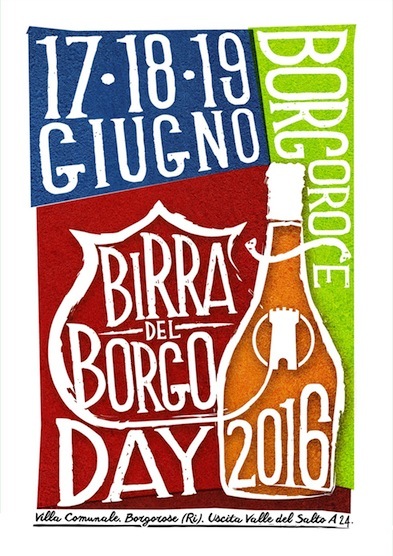 Birra del Borgo Day will enhance communication between sounds and flavors hosting thirteen live concerts of rock and blues street bands that will alternate on stage to stress the strong bond between music and beer. The event’s musical background will be led by Orchestraccia, Adriano Viterbini and Mark Hanna. Families and children will appreciate the kids’ corner set up by KIKIDS, jobs for kicks: free games and a rich continuous schedule for kids 4 to 11 years old, and fun workshops to tickle children’s fantasy and creativity. Birra del Borgo Day springs from the idea of melting together taste and experimentation, gathering and discovering, goodness and beauty, tradition and innovation, where music, beer and food give life together to new, surprising shapes. Beer will be the glue that holds together these different forms of culture, in between the small town and the big city, music and taste, arts and conviviality. A token is worth 0,10 cl draft beer, 2 tokens 0,20 cl and so on. Buongiorno, mi mandata il programma? Grazie. Com’è possibile raggiungere il luogo dell’evento con l’autobus di linea proveniente dalle marche? C’è qualche birra senza glutine? Si, tra le nostre l’Equilibrista e la Caos, le nostre due grape ale.